You are here: Home » » Geothermal? Today’s heat pumps have been designed and installed utilizing heating and cooling from the earth. These designs typically result in up to 60 to 80% in energy savings when compared to conventional systems. Recent advances in the design and operation of heat pumps utilize the ocean, rivers, lakes and anywhere there is an available low gradient heat source or ground source. “Everything on earth has heat in it and today’s heat pumps are able to utilize this valuable resource.” Solar collectors, boilers, and cooling towers are often used today providing highly efficient systems. The possibilities are endless as heat pumps enter the next century. The earth is a huge solar energy collector. The average earth temperature beneath your feet is about the same as the average annual air temperature. In the Canadian prairies that’s about 40-45°F (5-7°C). In Texas, it’s about 65-70°F (18-21°C). Geothermal systems make use of the renewable solar energy that’s stored in the ground. 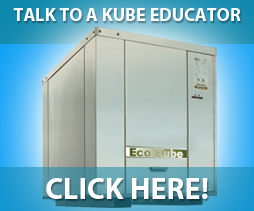 Kube Solutions’ geothermal heat pumps use proven technology that is both dependable and highly efficient. Integrated systems use 60-80% less energy than conventional systems. Companies and associations need to purchase less energy. Fewer greenhouse gases are released into the air. More consumers have access to better facilities and/or healthier indoor environments. Talk to a Kube Specialist for more information.